As you know, dogs love bones (without even meat on it) and they would spend hours working, crushing and grinding the bone, so that it can be consumed. In others words, dogs are highly attracted towards a bone, though it doesn't have any taste and nutrition. This toy is simply based on the fact, how a dog reacts while seeing a bone. That is the reason, this dog toy is being controlled by a piece of plastic in the shape of a bone(acting as remote control). Its electronically built in such an interesting way, that by simply shaking the bone in front of the dog, would make it jump (I mean it would stand on its two back legs instead of sitting on four legs as usual) and bark, and move forward as well. The bone also produces noise while shaking it. This is a great fun for the toddlers and they would simply love it. The toy also has the educational part other than the fun. There are also several press buttons on the body of the dog that teaches counting, alphabets, colors and shapes. Several sounds are produced when the dog is in action or in motion. Two songs are also played by this wonderful toy. Batteries are required for its operation. Here is a nice video to see the toy in action. This dog toy looks cute and it has two movable big ears which makes it more attractive. You might be knowing about Ozell Williams, who amazingly flips his body, and he ranks among the best in the world trickers. If you don't know him, and want to see his flippin actions just watch this youtube video. Action of flippin is something when a person jumps and rolls his body in air in complete 360 degree, and then land back on the ground with his feet. This is an amazing stunt which hardly anyone can do. Now, this same stunt is being applied to toys to amuse the children. 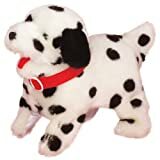 Tobar flippin puppy dog is built on the same principle of flippin action. Its a soft toy and there is a button to switch it on or off. Once you Switch ON the button, the dog toy will start barking, and then after moving forward for few seconds, it will suddenly flip upside down, just like you watched Ozell Williams doing the same in above mentioned video. This is all a great fun to watch the dog jumping for any child irrespective of their age. Just watch this youtube video to see this product or item in action. 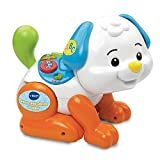 The no.1 toy mentioned above, was simply, when the dog only used to stand on its back legs, while operated through a battery. On the other hand, in the no.2 toy mentioned above, the dog actually does a 360 degree flip in the air, like Ozell Williams, when operated through a battery. That is the major difference between the two dog toys but both are worth buying. And remember, both the toys bark which should be the main feature of a dog toy. But the number 1 toy is more interesting as it does its actions by the shaking of a bone, while the 2nd one is operated only through a battery operated key.